What could you use a marshy wilderness map made more exciting by skeletons and giants for? Who were they, how did they get here and most importantly, what kind of creatures have been drawn here by the death and remains of eldritch spells that fill the area? It’s the area that sane people stay away from. Who were they, how did they get here and most important, what kind of creatures have been drawn here by the death and remains of eldritch spells that fill the area? Its the area that sane people stay away from. You could just pass through, but you could also find an important detail of your mission in this forest. The short background story and area descriptions will guide you to prepare your new adventure or to use this map to make your current one easier. You can plan longer campaigns using the night version, your adventurers will not get bored even at night (if you know what I mean). I constructed this map to make it universal, it will be compatible with the most common rulebooks, and in an alternate tile, you will find a crashed spaceship in the lake which make this map ideal even for sci-fi games. everything you can see in the map is designed, sculpted and painted by me, all to provide you the best, unique experience for your upcoming adventures. You cannot find these models anywhere else. If you are the type who likes the wonderful and breathtaking visual worlds of movies and games, then you can relive them on your gaming nights sitting around a table in your home (or online) with your friends. 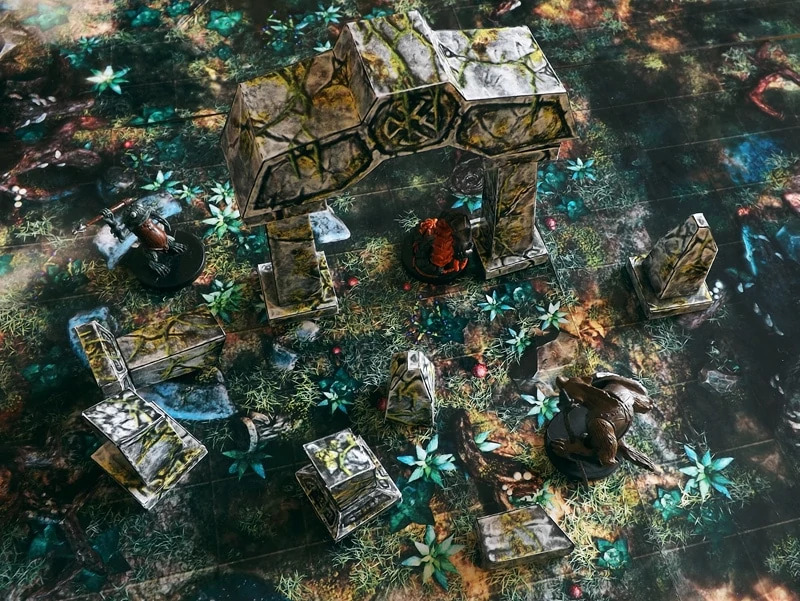 “Fog of war” on your tabletop! Without any accessories, blanket, paper sheets or anything you’ve used before to hide undiscovered areas. The size of this map is 36 by 24 inches but this is no mere map; its structured from 6×6 inch tiles which has lot of value! You only have to place the tiles that are visible for your players. This way you can reveal the dark secrets of the map during the adventure, just like a fog of war system. Ive designed this map to help you easily manage your adventure, the main areas fit to the borders of the tiles. This set will not do the hard work for you. As a Game Master you have a lot of work, outlining the world and the adventure, populating areas, making NPCs more believable and taking control over the story and team. This is what this product will not do, because it is not a pre-written adventure you can follow step by step. But Im sure the diverse areas, detailed graphics, area descriptions and those few adventure hooks you could use will provide a lot of help in the harder parts of this wonderful job. Its also possible to bend this map to your own original concept with the alternate lake tiles. + Isometric Visual Aid: you will get the isometric version of the map that you can show your players or use as a handout in your adventure. It makes the area descriptions easier and provides the players with more immersion. These PDF files are converted with custom CMYK profile that is better for most printers and use about 30% less black ink! You will get 29 double sided map-tiles! each one with 1″ grid overlay that includes the night version on their back side. The background story and description is printed on the tiles.